are recognized as one of the industry’s most reliable and highest performing membrane elements that deliver consistent quality and performance. Advanced manufacturing processes and utilization of the industry’s leading film technology allows these elements to deliver consistent results that equipment suppliers and water treatment dealers have come to rely on. This Membrane Element is Tested and Certified by NSF International against NSF/ANSI Standard 58 for material requirements only. AXEON residential membranes operate as low as 50 psi and can yield up to 23% more water than competitor’s membranes at 65 psi. 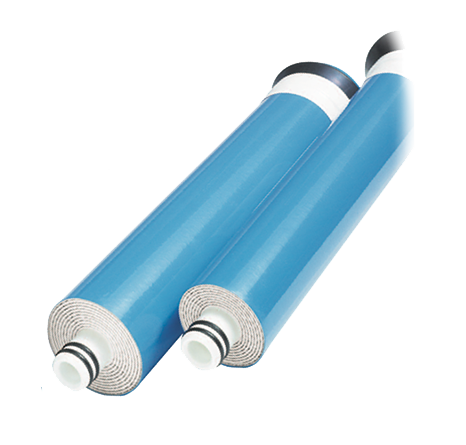 AXEON TF-Series Residential Reverse Osmosis Polyamide-Thin Film Composite Membranes offer reliability, high performance and deliver consistent results for higher quality water. AXEON membrane elements will fit a standard 2” x 12” residential membrane housing and are shipped dry for an indefinite shelf life and easier handling. Membrane elements may also be ordered as individually wet tested. Wet tested membrane elements must be kept sealed and moist when in storage. Drying out may occur and damage the membrane permanently. Prevent elements from freezing or being exposed to direct sunlight. Wet tested elements are vacuum sealed in a polyethylene oxygen barrier bag containing 1.0% sodium meta-bisulfite and then packaged in a cardboard box. Discard the permeate for the first twenty-four hours of operation.Do not use the first full tank of permeate for drinking or food preparation. The permeate flow (product water flow) varies with feed water temperature. Review a Temperature Correction Chart. For membrane warranty information, please contact manufacturer. The manufacturer believes the information and data contained herein to be accurate and useful. The information and data are offered in good faith, but without guarantee, as conditions and methods of use of products are beyond the manufacturer’s control. The manufacturer assumes no liability for results obtained or damages incurred through the application of the presented information and data. It is the user’s responsibility to determine the appropriateness of the products for the user’s specific end uses.